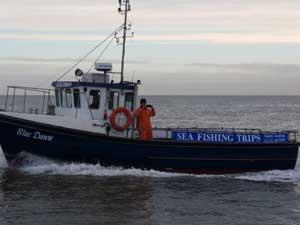 Blue Dawn Charters, Great Yarmouth, are a charter boat operation taking fishing parties out to sea aboard their vessel - Blue Dawn. All abilities catered for, tuition available, bait and tackle can be supplied at cost. Ferryside steps on South Denes Road, between Suffling Road and Salmon Road.